I will not claim this is an exhaustive list but any collection of blues piano (and blues) should have something by all these acts. Cow Cow Davenport - One could have selected his contemporaries like that tragic Pinetop Smith or the pioneering brothers of Sippie Wallace, George Washington Thomas and Hersal Thomas, but Charles Davenport came out of vaudeville (like Smith) and fortunately recorded extensively including his signature piece, “Cow Cow Blues” as well as such other gems as “Texas Shout” and “Atlanta Rag.” Document issued his complete recordings which included some strong accompaniments. Roosevelt Sykes gets my nod as the greatest of all blues pianists. Lee Green taught Sykes a lot and he began a lengthy recording career that continued until his passing while holding down a regular gig in New Orleans. With his boisterous vocal style one can imagine how he jumped the crowds at the barrelhouses, juke joints and other clubs. He is associated with “Honey Dripper Blues,” “Mistake in Life,” Driving Wheel,” “Sunny Road,” and his “Sweet Old Chicago,” derived as much from “Original Kokomo Blues” as “Sweet Home Chicago,” inspired Junior Parker and Magic Sam to revive “Sweet Home Chicago.” Of course he did his own definitive rendition of “Forty Four Blues.” He was equally superb solo and in small jump blues combos. One of my favorite Delmark albums is his “Feel Like Blowing My Horn,” with his friend Robert Lockwood Junior and others. Charlie Spand. I select him in lieu of Leroy Carr because Spand is less well known but such a marvelous pianist. Francis Smith in his definitive series on Piano Blues on Magpie devoted an entire volume to Spand whose “Soon This Morning,” is every bit a blues standard (Junior Wells and Sonny Boy do it as “Early in the Morning”). Other classics include some stomping piano with Blind Blake on guitar for “Hastings St,” while “Mississippi Blues" displays his fluent style. Pete Johnson. I limit myself to only one of the Boogie Woogie Trio. I won’t argue that Johnson is better than Meade Lux Lewis or Albert Ammons. Perhaps it is his association with Joe Turner (who did record with the other two). Johnson can be heard on many of Turner’s tracks including his early “Roll ‘Em Pete,” and the Atlantic “Boss of the Blues” album. 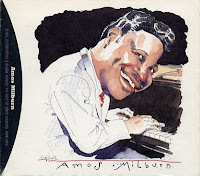 Amos Milburn. If one wants a bridge from the great boogie woogie pianists like Pete Johnson to the rock and roll giants like Archibald, Fats Domino one could do no better than this Texas born blues and boogie master who dominated the charts during the late forties and early fifties. The original “Chicken Shack Boogie,” a take on “Down a Road a Piece,” “Walking Blues,” and such drinking blues as “Bad Bad Whiskey,” “One Scotch, One Bourbon, One Beer,” and “Let Me Go Home Whiskey.” He inspired Floyd Dixon and there are his contemporaries like Ivory Joe Hunter, Charles Brown, and Little Willie Littlefield (still with us) that made many wonderful recordings, but Milburn’s piano had more impact at the time. Whistling Alex Moore. Texas spawned too many great pianists from Texas Bill Day, Joe Pullum, Rob Cooper, Andy Boy and others so picking Moore because of his stately playing as well as his folk poetry. He did benefit from the blues revival in the sixties which allowed him to show he was still a marvelous blues pianist, lyricist and singer. Camille Howard. There are other great piano playing blues women such as Georgia While, Julia Lee, Devonia Williams, but Howard’s piano with Roy Milton was as seminal as Mary Lou Williams with Andy Kirk’s Clouds of Joy a decade earlier. She was also a really solid singer and there was a fine reissue featuring her as a leader that was issued as part of the Specialty reissues that is worth seeking out.
" If it ain't got a guitar it ain't the blues". People are missing out if they don't listen to piano blues. Full of characters such as Roosvelt Sykes.
" if it ain't got a guitar it aint the blues"
Great list. Love them all and try and play like a few of them. Bringing things up to date, I think James Booker deserves to be #1 as much as Roosevelt Sykes, and best living surely includes Dr. John and Henry Butler. Redd Foxx Channels' Basie's "Boogie Woogie"